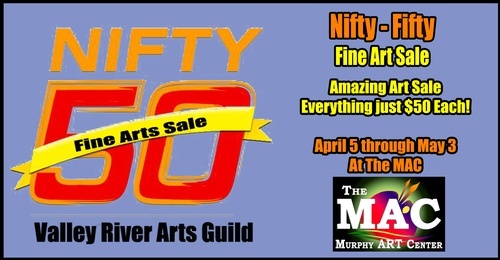 Nifty Fifty Fine Art Sale - Amazing Art - Only $50 each!. This is a Special Event Promoted by The MAC. Unique art on sale at the Murphy Art Center, all priced at $50 to benefit the 2019 Student Art Show! Customers have an opportunity to purchase art at a great value. "Sneak Peak" reception Friday, April 5, 3-6:00, refreshments will be served. Sale ends at First Friday Art Walk, May 3. Presented by the Valley River Arts Guild.